The Heart and Heart Rate Variability. Cymatics is the study of wave phenomena, pioneered by Swiss medical doctor and natural scientist, Hans Jenny (1904-1972). in his book, Cymatics, A Study of Wave Phenomena Dr. Jenny’s cymatic images are awe-inspiring, not only for their visual beauty in portraying the inherent responsiveness of matter to sound (vibration) but because they inspire a deep recognition that we, too, are part and parcel of this same complex and intricate vibrational matrix – the music of the spheres. In multidimensional consciousness, a wave is a sphere. It's important not to get too attached to our maps as they are only that, maps or representations. See the work of John Stuart Reid, an acoustic physics researcher. He has studied the world of sound for most of his life and and he carried out an acoustics study of the Great Pyramid. He is the inventor of the CymaScope, an instrument that imprints sound onto a water membrane, thereby making sound visible. The Importance of Water in sound healing. It is now known that water has a memory and that can also very much assist the deep profound healing from a session. Speaking the words love & gratitude to water makes a profound difference and creates a deep resonance that connects up with your own body & the water of the whole world. Simple attuning makes a big difference. The human body is 70% water, which is an excellent conductive medium for sound and vibration. Professor Emoto in Japan has done studies using x-ray crystallography, which demonstrated that when water freezes its crystalline structure is influenced by sounds in the environment. Harmonious sounds yield crystals, which are beautiful hexagons whereas disruptive sounds containing disharmony (yelling or cursing) yield crystals, which have dysmorphic irregular shapes. One could presume that our bodies have been influenced by disharmony in our environment and our lives. Water makes up over 70% of the human body and it is the medium through which the pure tone-light-vibration is transmitted to our cells. Old vibrations and toxins are very powerfully released by the purifying and cleansing action of the crystal. People often feel very thirsty after a crystal sound session. It is essential to drink plenty of water and to bathe or shower before eating again to gain maximum benefit including washing hair if possible. The pure sound causes a deep release on many levels, like a centrifugal force cleansing from the inside out. Water completes the process of deep cleansing. A bath or shower to the whole body including washing hair very much enhances the release and deep purification from the crystal sound. It is important to eat healthy foods, especially foods high in potassium like leafy greens, salads, sprouts, bananas, dates, apricots, figs and raisins, It is advisable to avoid alcohol and caffeine on the day of the crystal bowl session. One of the ways sound healing can be explained is by the phenomena of entrainment. Christian Huygens, a notable physicist, coined the term entrainment after he noticed, in 1666, that two pendulum clocks had moved into the same swinging rhythm, and subsequent experiments duplicated this process. Your body contains an autonomic mechanism that synchs you up with strong, external rhythms, pulses or beats in the same way, this is known as entrainment. Actually we entrain to rhythms around us all the time, although we are not aware of it most of the time. The relationship between the external rhythms and your inner rhythms or pulses is inseparable. In fact, our internal rhythms will speed up or slow down to match a stronger external rhythm. Try counting your heart beat or breathing rate when you’re stuck in traffic, around noisy machinery, or listening to loud rock music. Then count your heart rate or breathing rate when you’re sitting quietly on a beach or listening to peaceful music in a quiet surrounding. Other examples of entrainment include: When a musician has the audience spellbound, he or she has entrained them into the rhythm. A charismatic preacher can do the same with his congregation. When you meditate in a group, you feel the increased “strength” of the experience. Participating in an exercise class doing aerobics to up tempo music. When women become roommates, they often start getting their periods at the same time. The word resonance comes from Latin and means to “resound” – to sound out together with a loud sound. Resonance is a common cause of sound production in musical instruments. Musical instruments are set into vibrational motion at their natural frequency when a person strikes, strums or plucks the instrument. Each natural frequency of the instrument is associated with one of the standing wave patterns by which it could vibrate. The natural frequencies of musical instruments are referred to as the harmonics of the instrument. An instrument can be brought into vibrating at one of its harmonics if another interconnected object activates it with one of those frequencies. This is known as resonance – when one object vibrating at the same natural frequency of a second object causes that second object into vibrational motion. Resonance is really resounding or echoing back and can happen in many ways. Resonance between people occurs when we send out an inner vibration of our universal self and it is received and returned to us enriched, enlivened and reinforced. Each time we echo back to another our universal self grows. As that deep self is nurtured in resonance with 2 or more we create a field of resonant love that can be ever expanding. Each bowl is made of 98.9% silicon quartz. Our bodies have a natural affinity to quartz or silica , although on the cellular level our bodies are only composed of about 7 grams of silica (which is a very minute amount) The pure tone causes our bodies to vibrate in resonance.. The human body is composed of many crystalline substances:, the bones, blood and DNA are crystalline in structure, as well as the liquid crystal-colloidal structure of the brain. On a molecular level, our cells contain silica, which balances our electromagnetic energies. Our bodies resonate with the pure sound and the energy centres/chakras are balanced and cleansed by this. The crystal bowls are made from the same silicon chip used in computer technology. Like computer chips the crystal bowls can be programmed to receive, hold and transmit information. The effects are enhanced because the bowls are made of quartz. Silicon crystal acts as an oscillator, magnifying and transmitting pure tone. This is why pure quartz crystal is used in all the world’s most advanced telecommunications systems and computers. 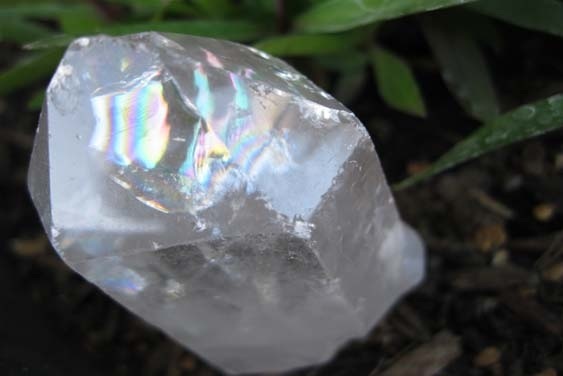 Clear quartz crystal is an extraordinary substance that holds the vibration of pure white light. It amplifies, purifies and harmonises. The light/sound vibration refracts into the rainbow and acts directly on the chakras when played. The sound brings about a positive shift in consciousness. It literally changes our vibration so that we glow with increased health and radiate frequencies of greater light. Our Responses to Crystal sound therapy. My clients react in different ways to the sounds of the bowls. After hearing the crystalline music people may remain in a very deep state for some time. It is during this time that the deepest and most profound healing may take place. It is important to come around gradually and gently. The pure crystal tone can reach, inspire and move us to great depths in body, heart and spirit. There is a magic and luminescence that is hard to describe. There is the medicine quality of sound, light, prayer and healing intention combined. It is a very high vibration. Many people have reported life-changing experiences after the crystal sound healing sessions and a profound sense of well-being and peace. Each bowl represents a note of the octave, which resonate with a specific chakra and colour of the rainbow. The crystal sound harmonises and revitalises the chakras, which are vortices of energy within the body. There is a sense of inner peace and attitudes of joy, love, surrender and gratitude are awakened. I have programmed my crystal bowls to amplify each listener’s self-healing ability, to purify, cleanse and heal. I have tuned them to awaken consciousness moving us towards the state of unconditional love, oneness and peace. Ultimately, to be our true radiant selves, conscious beings of light and love. The tone increases clarity, harmony and purpose. These vibrations ripple outwards creating an atmosphere of peace and harmony. I have found that individual experiences of the bowls vary dramatically. Some people go into a state of deep and quiet meditation; others may lose all sense of time. Some may have visions or receive insights or may feel energy in different parts of the body. Deep feelings and emotions may be awakened. There is increased spaciousness; softness while the ability to work through and release feelings is enhanced leaving a sense of profound stillness. The crystal sound takes us into a space of non-linear time. It penetrates to the core of our being, empowering us to be more fully in the present. Crystal quartz singing bowls are a by-product of the computer and pharmaceutical industries. The bowls are created by a high-temperature fusion procedure which forms solid bowls from pure, powdered, crystal quartz. Perfect quartz crucibles are the prime growing environment for computer microchips. Each bowl is examined for size and thickness, and if not exactly to the specifications of Silicon Valley, it is rejected. Previous to the beginning of the interest in sound healing, the rejected bowls were broken, re-powdered, and re-used to form another bowl. Gradually, as sound therapists became aware of the vibrational qualities of the bowls, they began to buy the “seconds” as tools for vibrational healing. Now many are created specifically for healing purposes. They have also been used in the pharmaceutical industry for decades, for use in laboratories because of the purity and non-transfer nature of quartz..